I opted for a few side dishes and BBQ. I mixed up the salads, while B fired the hamburgers and sausages on the grill. Lighter sides were essential because of the high temperatures and all the swimming taking place, so I served veggies and hummus, corn nachos and bean dip, and fruit skewers. There is so much tropical fruit available in the summer, so I was sure to include mango, kiwi and pineapple. I kept the top of the pineapple to act as a garnish on the serving tray. 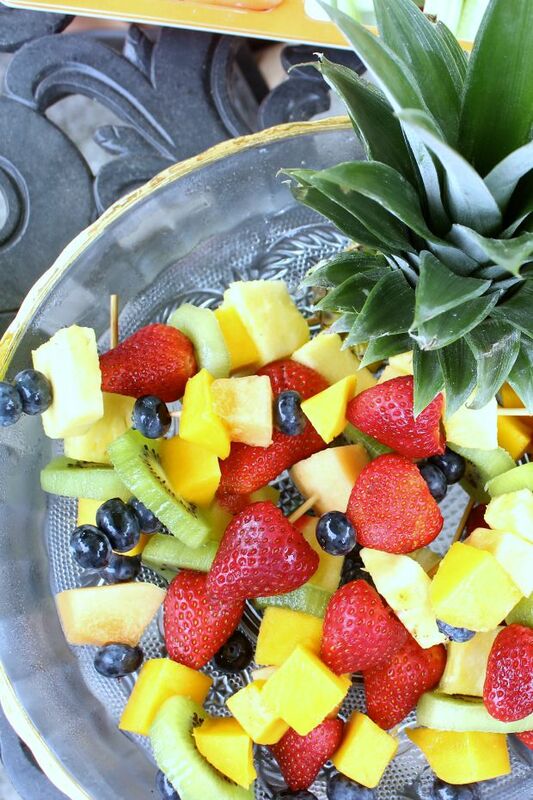 All refreshing and delicious! 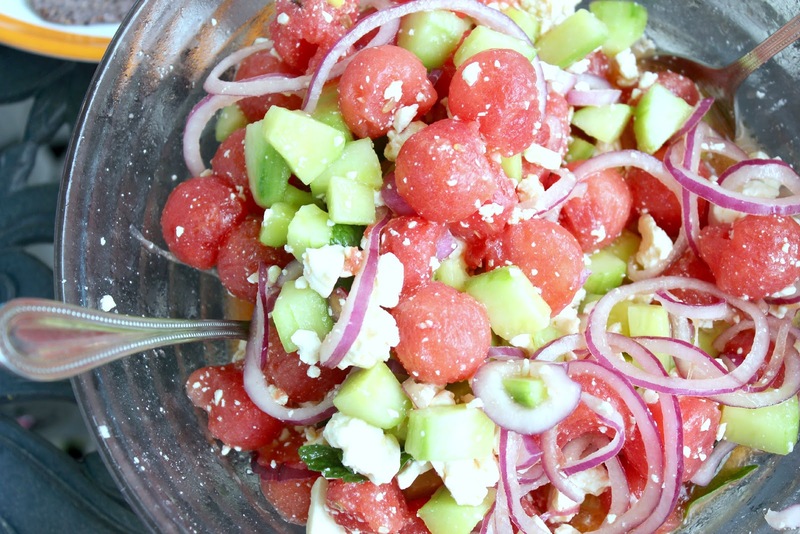 I also whipped up a watermelon, cucumber and feta salad --which was amazing! It's light and filling and is now my new favourite. The sweetness of the watermelon, combined with mint and basil made my tastebuds swirl! The dressing I chose was just fresh lime juice, a touch of oil and salt and pepper to taste. You can find a variety of recipes on Pinterest. So simple! As you saw here, we kept it cool and light for dessert serving up smoothie pops and banana bites on ice. There was also an ample amount of fun candy on skewers to garnish drinks or eat straight up! Staying hydrated is key while you're outdoors. We filled a water dispenser with strawberry, mint, and lemon infused water. We also had a cooler on wheels filled with the more exciting drinks just next to the bar cart. This saved everyone from having to run indoors to the fridge to make themselves another drink. The bar cart was filled with fun glasses and straws so guests could help themselves. The natural surroundings acted as a beautiful setting so the decor was at a minimum. To keep with the tropical and bright vibes, I sliced up bright pool floats and strung them together to act as a banner on the fence. 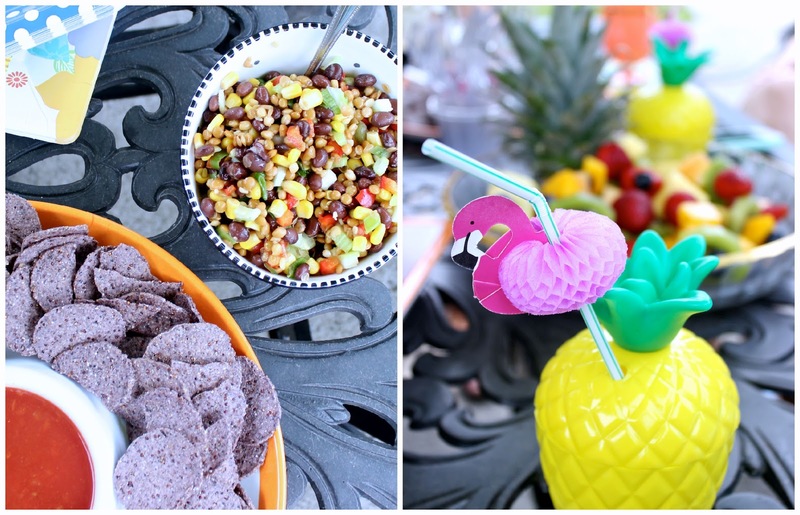 Bright pool floats, blow-up flamingos and beach balls were dual purpose; decor and for fun! Pink striped beach cushions were placed on the grass to act as a chill-out station. We also had water balloons out and ready to be filled for some sneak attack games. The bar cart was really the only other element of decor. All the pieces on the cart had a central theme-- bright and tropical, but overall did not seem too coordinated! I used a variety of decorations I had made for previous occasions, like this tassel banner, and these gold sparkly mason jar vases. 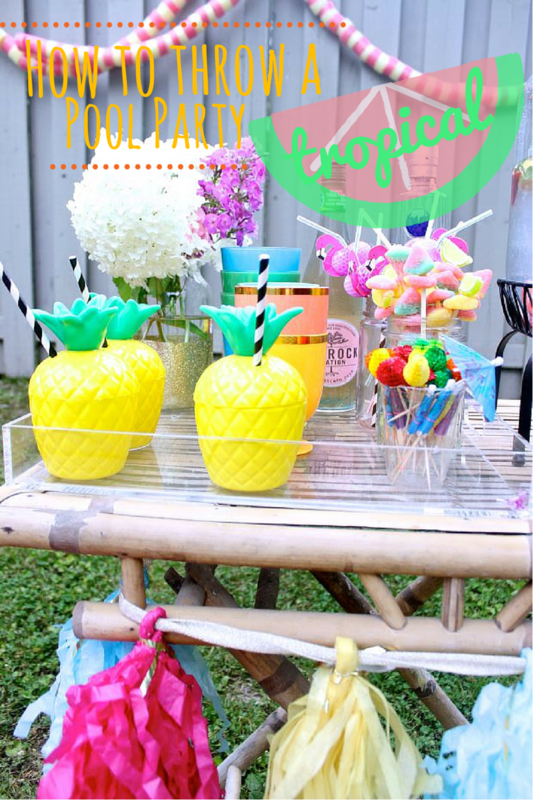 The straws and drink toppers are all accessories I had lying around the house, and the pineapple cups I found at my local party store. Getting your friends together for some summer fun does not have to be intimidating. It can be as relaxed and casual as you wish. Having bright accents in terms of pool accessories, food, cups and straws all create a cohesive tropical vibe to your event without seeming so done-up and coordinated. Have fun with it, and enjoy the summer while it's here! You only have a few more weeks! Get on it girl! 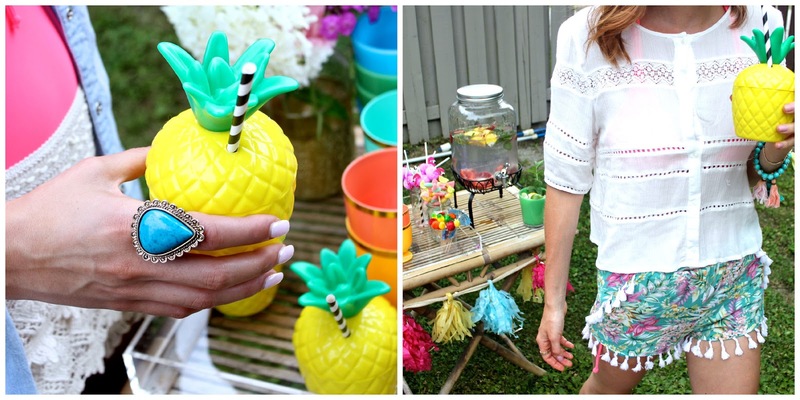 The pineapple cups are from Party City! They are so fun. WOW! This post is completely fun and beautiful - I absolutely LOVE your photos! I think that I might have to crash your next pool party! Our planner knew tons of vendors but knows which vendors would work well with my event and venue. They were all great. The event coordinator would try to attend as many vendor meetings as she could. Which was very helpful. One factor to keep in mind is seeking out the exceptional pool cues you may fin. So what are the fine pool cue How To Choose The Perfect Pool Cue For You!